So it all started when my son wanted a “blue fish” (a betta) so, my wife and I got a betta and a small freshwater tank (10 gallons). While talking about the tank with a friend who has a similar aged child, I found out that he was into SW tanks and he had a Biocube 8 that he would be willing to give me. He also pointed me to RC and that is how my SW fascination began. 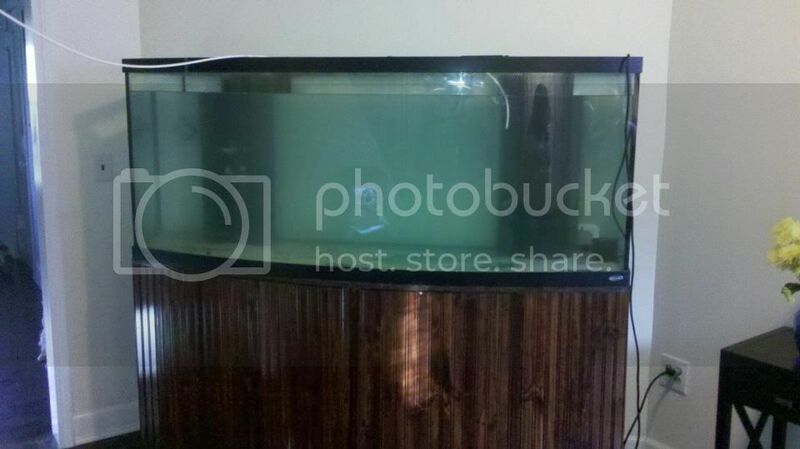 I had the BC set up in early August, with an occelaris clownfish named “Elmo”, but I really didn’t think it was big enough soooo….I figured I would get a tank that was a little bit bigger. I started eyeing 75 gallon tanks and was fully planning on getting one around that side, until I saw a gorgeous group of fish called “Tangs”. Well you all know what a small choice of Tangs you can have in a 75 gallon tank and I had this seven foot wall in my foyer that was bare. Well as you can guess I was thinking of getting a 125 gallon tank, leaving me about six inches on each side of the tank to view the sides. But once again I RC did me in and I saw another gorgeous fish, an Achilles Tang. Well once again my “little bit bigger” tank jumped up another notch to 180 gallons. At this point I said okay, that is as big as I am going to get. 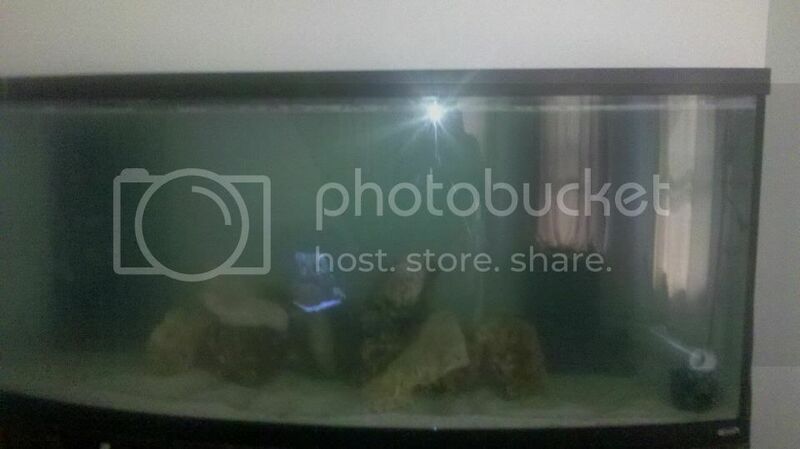 So, I started perusing craiglist for tank and I also put a “WTB 180 gallon tank” on a few local forums. Within 24 hours I received a message about a 215 Oceanic Bowfront tank with stand and sump for $450, and about 100lbs of LR for another $100. 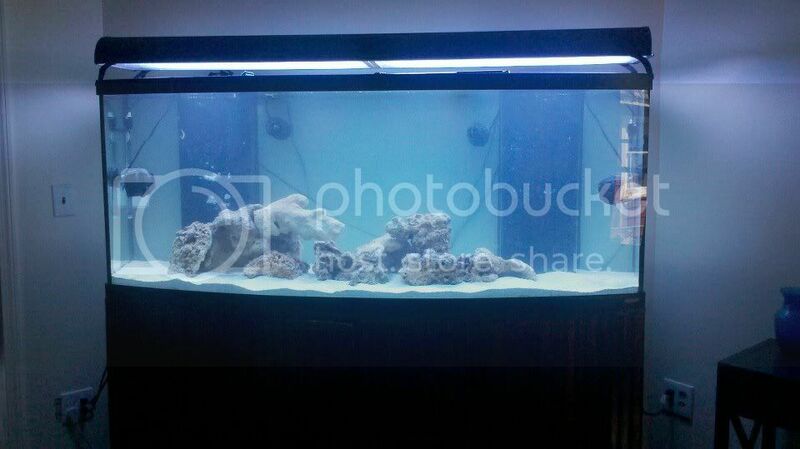 Since this tank actually has a smaller footprint, more height, than a 180 gallon so, I decided to go for it. Here is the aquascape I did. I do plan on buying more rock and adding it later, I will probably get another 100 lbs of dry rock but only add it a little at a time and keep my bioload low until I get all that I want. At this point I still need powerheads and lights, so I looked around to find this equipment. I ended up getting a 6 Bulb Nova Extreme Pro with ATI bulbs for $360 (brand new bulbs) from a friend. I then found a deal for four Koralia 3’s and a Red Sea Wavemaker Pro for $150. I knew that was not going to be enough flow but I thought I could keep it at that for a little while until I could upgrade them. As you can guess I was wrong in this assumption and I quickly purchased two Koralia Magnum 8’s to run with two of the 3’s. I am happy with the flow I have now. I briefly put them on the wavemaker, but I am not a huge fan of the noise that comes from the 3s when the powerheads turn on and off. I want to read up more about how the Koralia’s stand up to the wavemaker cycling power to them before I try to put them back on it. And that is where I am at right now, tomorrow my CUC comes, 25 dwarf ceriths, 25 turbos, 10 Florida Cerith, 25 Nassarius, 10 Nerites and 1 Florida Fighting Conch. 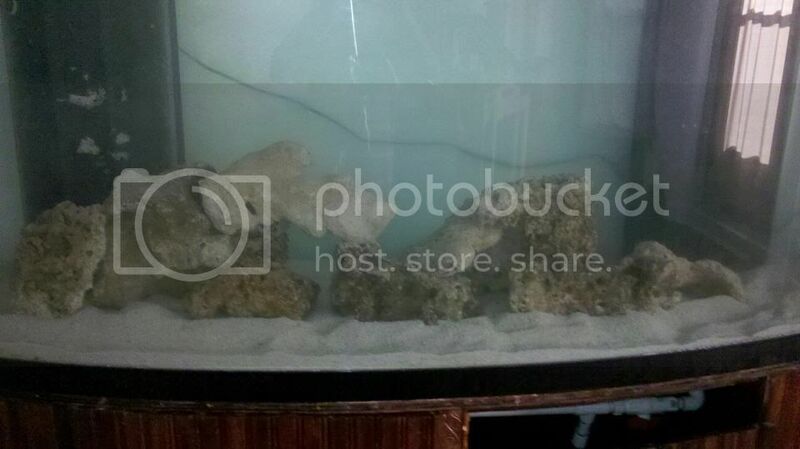 I will give it a week or so and I will bring over my occeralis clownfish, green clown goby (after I get the top built), and my corals and rocks from BC 8. After I kill the aiptasia and red bubble algae. I really need to get a black background on there and I am also planning on painting the stand black. I like how you upgraded from an 8g Bio cube, To a 215g Bowfront!That's awesome!Good thing u did your research about the tangs, most people set up a tank not knowing what they are going to put in it, and figure out it was not as big as the fish they wanted to keep needed, anywho...what about corals!Any plans for that? So much potential to play. Looks great. Have fun!! Are you gonna FOWLR it or do corals? "Winners do what they have to and losers do what they want"
Yeah, the upgrade got a bit out of hand. The clown goby's name is Gregory and she even named the snails, how the heck she keeps track of which snail is which is beyond me. Last edited by rogermccray; 10/12/2011 at 12:39 PM. Whatever it takes to keep them onboard. Once they get bored, the problems begin. Lookin forward to your build! Can't wait to see it down the road, it already looks fairly interesting!!! You had a good size upgrade there, not sure if you will be able to add many more fish with Elmo lol. Looks good so far keep it up! Wow, very nice. My 65 gallon isnt even finished cycling yet and im thinking bigger, however i have to wait until we build our new house. Very nice build and some great deals. Thanks! don't go 25x bigger like I did , 1625 gallons might be a bit much. 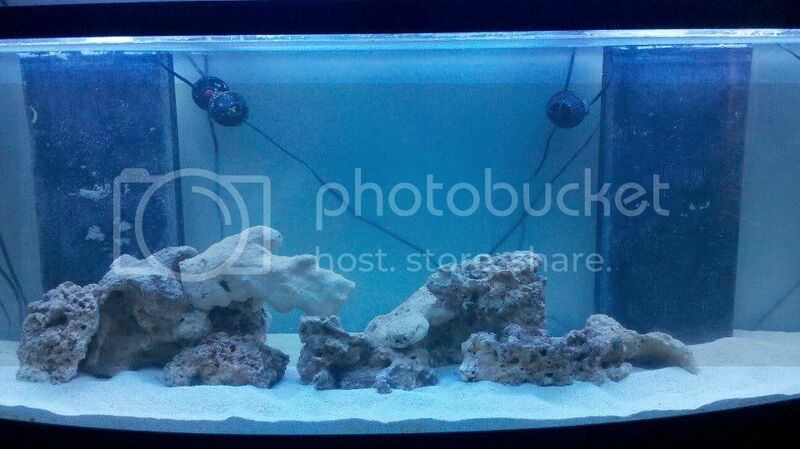 Chad, crichard6069, is just waiting for me to get the fish tank set up so he can pawn his third occ. clown. He keeps jumping in the over flow because he is the third wheel. He is also the one that gave me all the free equipment so, I guess I could take the fish off his hands so he doesn't have to keep fishing him out of the overflow. Though I don't want to have to fish him out of the over flow so that may or may not be a good idea. 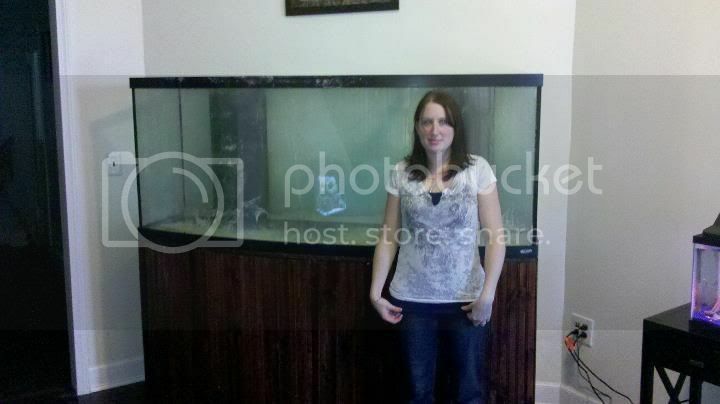 215g tank with sump and stand for $450 bucks...seriously how come those kinds of deals never come up around here? Ugh lol. Grats on your new build! Hope you have a lot of fun with it. Sweet deal !! Have fun and go slow. It worked wonders and my tank is a lot more quiet now. Off to a good start. 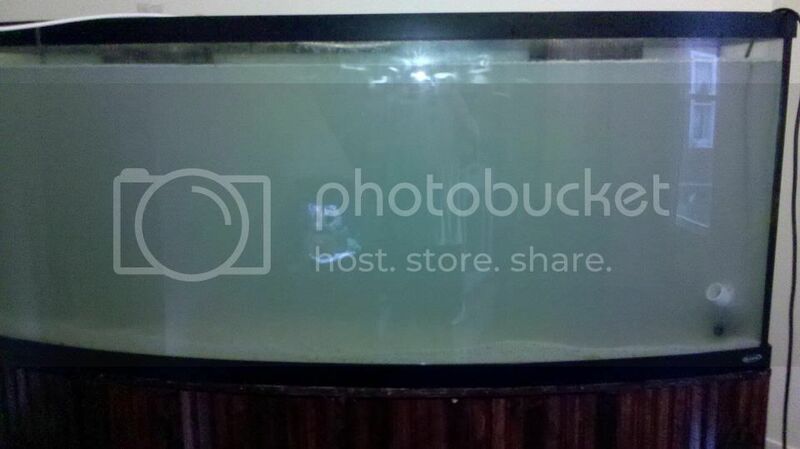 Tell the wife she should model for your reef central pics with the tank lol.